Another cute blogger template/linda plantilla de Blogger for you, Me and My Bear blogger template. Its name based on graphic on header, girl with her bear. As you know, I like to create woman and girl template, so this is also for your girl, use it on your personal diary blog. You also can customize it with another cute blog header. how can i put this on my blog? Me and my blogger so nice and lovely that can be more enjoyment and entertainment in this blogger so nice and informative post shared on the site. 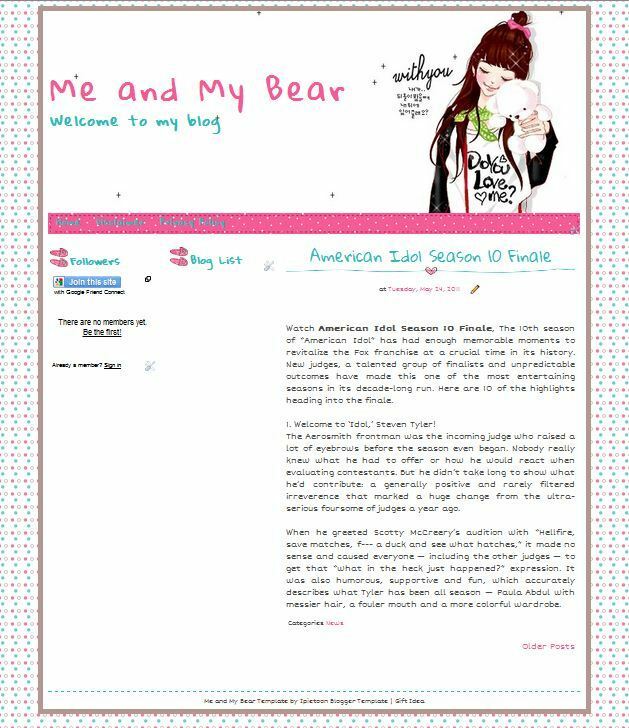 Mostly people are very like it me and my bear blogger so that can be enjoy it. the wonderful site and fantastic site post on the site. very touching blog template for female. waahh very cute templates! how can i use this as my blog templates? can i change the backround of this template? pls tell me hw to change it? Ikh, I love it ..
can you make the new one ?? hmm .. if you want .. i wanna make miss whatever blogger template .. can you made it for me /? I really like this! but how do I use it on my blog? pass d priview error . katanya "kesalahan bX-ev2g3m"
tapi klo coba template yang lain bisa .. I love it ! I download it ! Hi! I'm a blogger, and I decided to download your template. I'm Brazilian and I'm using the translator, so some words may be wrong. Well, I'm just here to say I loved your template and using it. Kisses and even more!